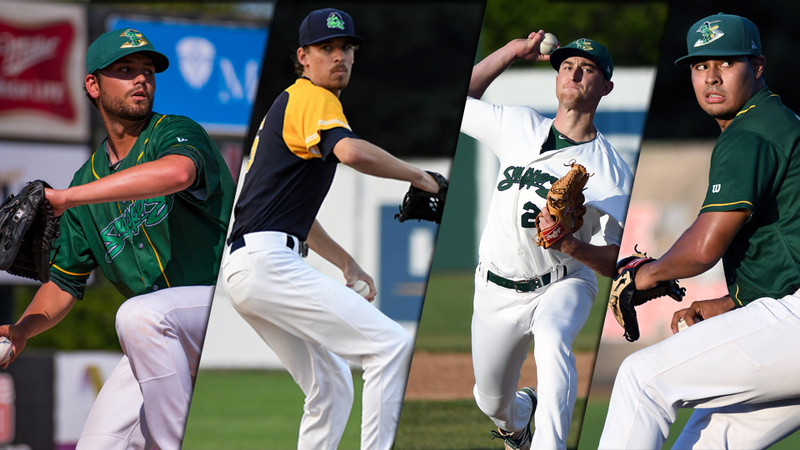 On the field in 2017, the Beloit Snappers had countless memorable performances throughout the entire season. The Snappers will release a list of "17's Top 17" to reveal the best moments from the past season. This countdown will include entire games and snippets of the Snappers 36th season of professional baseball in Beloit. Pitching brought many moments that require applause as we reflect on the third installment of the top 17 moments of the 2017 season. Snappers pitching ended the year fourth in the Midwest League with a team ERA of 3.55 and finished fifth in shutouts with 12. Five of the Snappers shutouts occurred during a span of 11 days at the end of July. Beloit pitchers led the Midwest League with a 2.57 ERA during that month. The first shutout was a 2-0 ballgame against Midwest League juggernaut West Michigan on July 20; it was just the Whitecaps third shutout loss in their first 93 games. Zack Erwin and Seth Martinez stymied the South Bend Cubs next on July 23 as the tandem retired the final 20 Cubs that came to the plate. Shutout No. 3 came from seven scoreless innings by Xavier Altamirano on July 27 at Kane County combined with Joseph Camacho and John Gorman scoreless outings. The last two goose eggs were back-to-back shutouts against the Burlington Bees on July 29 and 30. The Snappers rode a wave of 20 straight innings without a run allowed while the Bees suffered four straight shutouts and a total of 36 innings without scoring. Starters made eight quality starts in July while relievers Heath Bowers, Yordys Alejo, and Sam Sheehan all navigated through the entire month without allowing a run. Brandon Bailey, Seth Martinez, and Sam Sheehan combined for 23 strikeouts in a game on June 26 at Peoria. The game lasted 12 innings and was started by Bailey in what would be his final outing with the Snappers. Bailey struck out 10 in just four innings while Martinez set a new career-high at the time with eight whiffs through five. Reliever Sam Sheehan earned the win with three innings of work to the end of the game and struck out a season-high five Chiefs. The 23 punch outs are the most a Snappers team has ever recorded in a game during the Athletics era and were the most in a single game by any Snappers team since August 27, 2006 when they struck out 25 in 19 innings against Cedar Rapids. South Bend was the only Midwest League team to record more strikeouts in a game during the 2017 season. Dalton Sawyer, a weekend starter at the University of Minnesota during his college days, threw exclusively out of the bullpen in Vermont a year ago and then made three outings on the back end of the Snappers' piggy-back system to start 2017. On April 19 at Pohlman Field, Sawyer retired all 15 Burlington Bees he faced in five innings while striking out eight in the Snappers 8-0 win over the Bees. This was no fluke either. That five-inning start was the first of his professional career, but he used those five innings to extend a scoreless streak that would go 17 innings from April 14 through 27. His 15 consecutive batters retired were not surpassed by any other pitcher during the season and was matched by Seth Martinez with five perfect frames in relief on July 23. Performing as one of the Snappers best starting arms, he was called up to Triple-A Nashville to make a fill-in start on June 4. He made one more appearance for the Sounds on July 5, but he never returned to Beloit and ended the year with a 3.56 cumulative ERA between Nashville, Beloit, and Stockton. A 12-inning game on May 19 at Peoria had one of the oddest endings to any game in 2017. Trace Loehr dropped a suicide squeeze to score JaVon Shelby for the go-ahead and eventual winning run in the top of the 12th. Since the two teams played 15 innings the night before and the Snappers used a total of seven pitchers during the first two games of the series, designated hitter Kyle Nowlin was called upon to pitch in a save situation. Nowlin made his third appearance of the year that night and allowed a leadoff single before he induced three flyouts to lock down the Snappers win. Nowlin was awarded a save, the first ever by a position player in the 36-year history of Beloit Professional Baseball. Matt Milburn had one of the most dominant performances by a Snappers pitcher this season against the Clinton LumberKings on June 23. He was the first starting pitcher to throw a full seven-inning start and allowed just one run on three hits. The big number that jumps out: 12 strikeouts. The righty out of Wofford had a pair of strikeouts through the first two innings, but he then struck out the side in the third and ramped up his total to five. He whiffed multiple batters in the fourth, sixth, and seventh to finish his night with an even dozen punch outs, the most by a Snapper all season. He followed that performance with eight more strikeouts in his next start and led all of Class-A baseball with 39 strikeouts during the month of June. Milburn's dazzling outing was one of three 10+ strikeout performance by a Beloit pitcher in 2017, all on the road. Dakota Chalmers struck out 10 Kane County Cougars on April 17, and Brandon Bailey whiffed 10 Peoria Chiefs on June 26. That trio is the first three Snappers to reach double digit strikeouts in a game since the Snappers have been the Oakland Athletics Midwest League affiliate.